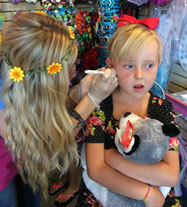 We strive for perfection in our ear piercing and make it a comfortable experience. Ear piercing done by a trained specialist. 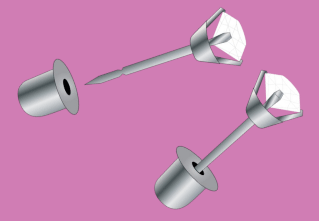 We use a registered medical instrument to pierce. It is the safest system for lobe and cartilage. New! : We also have numbing cream to make the experience completely pain free and fun! Our unique patented safety back promotes safer healing by allowing optimal air flow around the back of the earring. The safety back also prevents the earring from being over tightened to the ear. Only Inverness piercing posts are fully encapsulated to prevent accidental cross contamination. Earrings range in prices from $25-$78. Safety backs are surgical steel or 24kt gold plated surgical steel @ $2.50 per pair. Your just pay for your earrings the piercing is free! 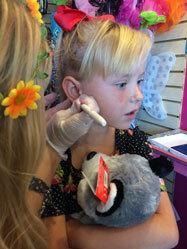 Infant ear piercing for newborn to 1 year, there is an extra $25 fee, in addition to the earring purchase. Our earrings all come in sterile prepackaged cartridges. We we do not have to use needles to pierce your ears. The only thing to go through your ear is your earring. This makes the experience fast and less painful. Our earrings also all have locking backs on them. This is good for little ones so they wont come out and close up or get lost. These locking backs are also good for first piercing because they have rounded closed backs so they will not poke, get caught on things, and do not sit directly against the ear (this lets the new hole breathe and makes healing a faster process). If you have any other questions about our piercings feel free to give us call and ask away! Earrings that we pierce with must stay in for six weeks. After that you can take them out and put something else in but you must keep something in your ears for one year all the time so that they do not close up on you! New piercing must be cleaned with ear care solution twice a day (morning and night). We sell ear care solution here at the store $5 for a bottle. If you experience irritation it is best to keep earrings in and keep the area very clean, most irritation will go away in a few days. Irritated holes close much faster than non irritated holes. If you are unsure about your piercing stop by and let us have a look or give us a call! Looking for Something More? 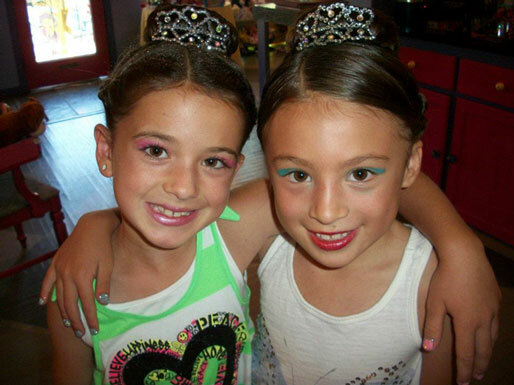 Check out our Party Add-Ons! Copyright © Clubrazzberry.com. No content may be used without permission.